Our motto: Get your smile back! Our mission statement: We are committed to excellence and continuous improvement. That means treating patients in a caring and professional manner by using the highest quality dental products. We pledge to improve your oral wellness and will inspire you to lead a healthier and happier life by promoting healthy living. We pledge that we will provide dental services and products with professional quality that meet or exceed the standards of the American Academy of Periodontology, American Dental Association, Minnesota Dental Association, and other government agencies that govern the dental profession. 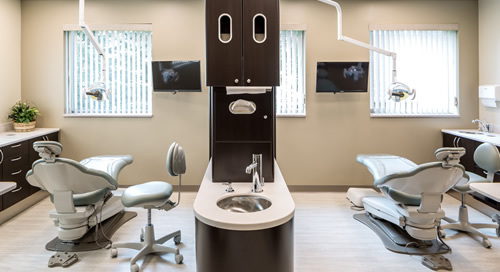 We pledge that we will serve our patients with compassion and excellence, providing quality dental services with an understanding that each patient has his or her own personal needs and concerns. We pledge that we will be good community citizens, respectful of the environment, actively engaged in community service events especially related to elderly and their overall health and well-being, and friendly neighbors to the surrounding businesses. We pledge to encourage each other to grow personally and professionally. We are a unified team of professionals who enjoy working together to support our patients, each other, and our mission. Have you noticed that your gums bleed while brushing or you have bad breath? Is your smile affected because of receding gums or a missing tooth? Gum disease is a major cause of tooth loss in adults, and research has suggested gum disease is associated with other diseases, such as heart disease, diabetes, and rheumatoid arthritis. The practice offers treatment related to any gingival/gum problems for cosmetic or therapeutic reasons and Dental Implants to replace your missing teeth. As a periodontist, Dr. Menon focuses her treatment on saving teeth affected by periodontal disease and stop it from progressing. The practice aims on getting your gums back to a healthy state and help you maintain it. If it is too late to save your teeth, we can also discuss and provide the treatment option of Dental Implants if it is the right choice for you. We also offer simple and quick to use Oral screening services that is non-invasive and its high sensitivity to tissue changes allows for a more thorough oral exam. This helps with detection of various oral conditions such as Oral cancer and Oral lesions. When you visit our office, your SMILE, HEALTH and HAPPINESS are our top priorities. Our entire team is dedicated to providing you with the personalized, gentle care that you deserve. Part of our commitment to serving our patients includes providing information that helps them to make more educated and informed decisions about their oral health needs. This website is a resource we hope you'll find both useful, interesting and motivating. © Copyright 2011 - Dental WebSmith, Inc. and Menon Periodontics and Implants, LLC. All rights reserved worldwide.